Image caption Sir Roger Moore has died at the age of 89 following "a short but brave battle with cancer"
The statement, from his children, read: "Thank you Pops for being you, and being so very special to so many people." "With the heaviest of hearts, we must share the awful news that our father, Sir Roger Moore, passed away today. We are all devastated," they said in a Twitter post. The actor took the character of James Bond in a more humorous direction than his predecessor Sean Connery. "The love with which he was surrounded in his final days was so great it cannot be quantified in words alone," read the statement from Deborah, Geoffrey and Christian. "Our thoughts must now turn to supporting Kristina [Tholstrup, his wife] at this difficult time." The statement added: "We know our own love and admiration will be magnified many times over, across the world, by people who knew him for his films, his television shows and his passionate work for UNICEF which he considered to be his greatest achievement. Along with his famous Bond role, Moore was also known for TV series The Persuaders and The Saint. Russell Crowe led the tributes to the actor on Twitter, writing simply: "Roger Moore, loved him." Michael Caine said: "I am truly sad and think I will be in tears if I talk about him. "Roger was the perfect gentlemen, adored by all his friends." Michael Ball said: "My dearest uncle Roger has passed on. What a sad, sad day this is. "Loved the bones of him. Generous, funny, beautiful and kind." 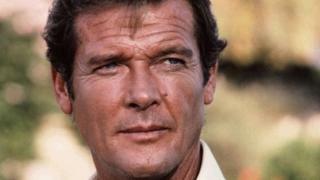 Mia Farrow wrote: "Few are as kind & giving as was Roger Moore. Loving thoughts with his family & friends," while Boy George added: "RIP Sir Roger Moore. He was the king of cool." Duran Duran, who sang the Bond theme song for A View To A Kill, simply tweeted: RIP Roger. In a statement, fellow Unicef ambassador and actor Ewan McGregor said: "Thank you, Roger, for having championed so tirelessly the rights of all children for the last 26 years. "You've shown that we all have the power to make a change to the lives of the most vulnerable children." Frank Gardner, the BBC's security correspondent, recalled how he and Sir Roger had become good friends in recent years. "He even watched me ski past his chalet in Crans-Montana [Switzerland] while sipping a drink on his balcony," he said. "He had a wonderful sense of humour and I will miss his jokes by email. We had lunch together only a few months ago and even after all these years he seemed surprised that his career had been as successful as it evidently was. We will miss him."